In one of my current projects I have to import an Oracle database dump into a development database every two weeks. But more than once there were tables missing, columns have been changed, or indices have been removed in the new dump. Of course, that led to problems with the programs that used the database. 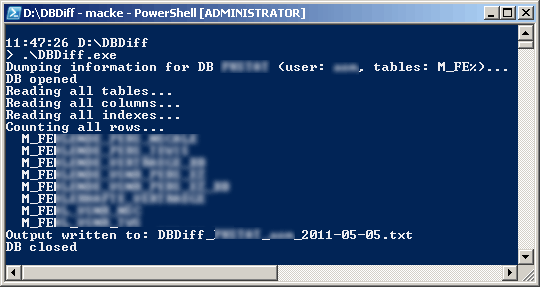 So, before I import the new dump, I create a textfile with DBDiff that contains the current database state. After the import I create another one and compare it to the old file giving me all the changes to the database structure. Of course, the tool could also be used to compare a production database to a development database. All needed configuration (DSN, credentials etc.) is done in DBDiff.exe.config. The database needs to be configured and reachable as an ODBC source.